Mushrooms are one of Mr. P’s favorite foods of all time. I, on the other hand, loathe them. It’s not the flavor, though, it’s the texture... the spongy, squishy, gag-inducing texture. I don’t know if I have some repressed childhood memory of chewing on a mushroom while something horrible happened, but I do know that I don’t even really like cooking them. Which is really unfortunate for Mr. P.
But because the flavor doesn’t bother me, I end up putting Cream of Mushroom soup in lots of things as a compromise. The teeny bits of mushroom are okay with me (so long as I don’t think about them too much) and Mr. P gets his mushrooms, kinda. And the one dish where mushroom flavor takes center stage? Stroganoff! 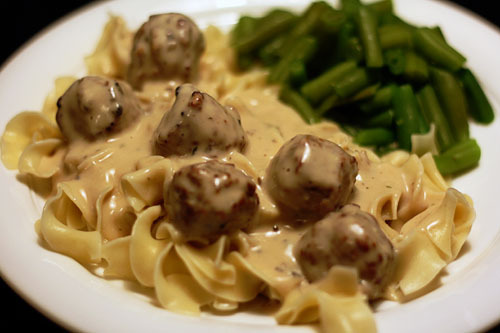 In the time that Mr. P and I have been married, I’ve experimented to create what I think is a quick and tasty stroganoff-style gravy for meatballs. And because I think I’ve finally got it down, I can share it with you! 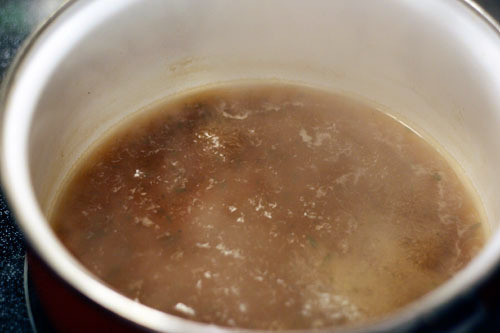 You start by combining a cup of beef broth (about half a can) and a quarter-cup of Marsala wine with some black pepper, dried parsley, garlic (I use pre-minced), and onion (I use dried), and bringing it all to a gentle boil. 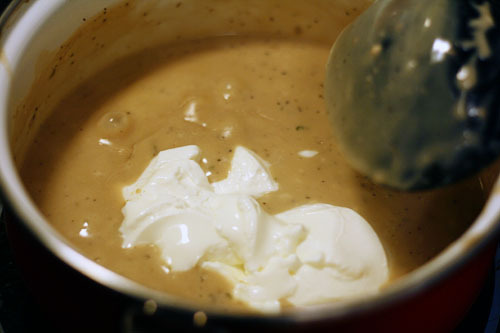 Let it simmer over medium heat until it reduces by half. Normally I like to reduce liquids a bunch to pack in the flavor, but in this case it helps to leave the liquid to thin out the sauce. Also, if you don’t have some deep, irrational loathing of mushrooms as I do, this would be a good time to sauté some sliced mushrooms to add in the final dish. I realize that looks... not very promising. 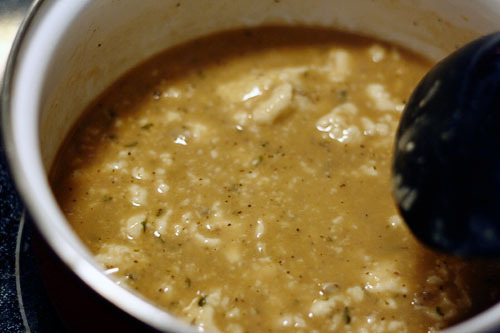 But as it heats up, those chunks break up to create a nice smooth sauce! Honest! So, once it smoothes out, reduce the heat to low and add in at least a half-cup of sour cream (I usually add a few big spoonfuls). As that gently simmers, I prepare the meatballs. Which are not homemade because I really can’t be bothered to make meatballs, even if they are ridiculously cheaper than the store-bought version. If you want to make your own in advance, go for it! 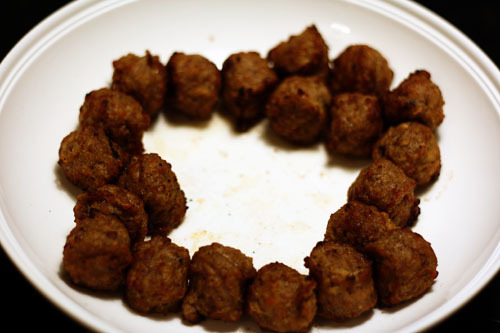 I, on the other hand, will be microwaving Swedish-style store-bought meatballs (about twenty or so). This way, the rendered grease all drains in the center of the dish as they heat up, and I can mop it up before adding the meatballs to the sauce! And then I just let them simmer while I boil 6 oz. (half a package) of egg noodles (technically egg-free egg noodles, because again, I am quirky) and prepare some sort of green vegetable on the side. 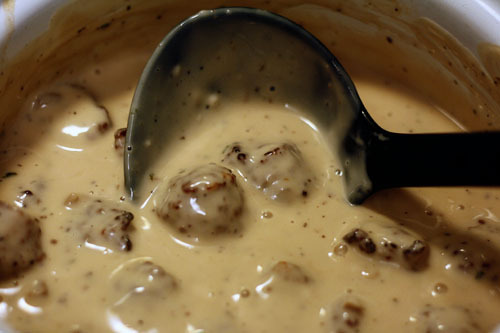 While I totally crafted this sauce/gravy concoction myself, I admit that I recently noticed a very similar recipe on the back of the package of frozen Swedish meatballs. Huh. But rather than feel silly for wanting to share a recipe that you could find on a bag of meatballs, I am going to take that as vindication! Because this really is delicious, and it comes together super quickly after a long day at work. For that reason – and for Mr. P’s love of mushrooms – this is in our usual rotation. Hope you enjoy it as much as we do! I feel exactly the same way about mushrooms, but I too like stroganoff!